When it come to cycling, the French Alps offers cyclists some of the best cycling routes in the world. They are full of legendary mountains with years of Tour de France history. Furthermore, they provide the gateway to the epic “Route des Grandes Alpes”. This fantastic challenge takes you from Lake Geneva to the Côte d’Azur. We have designed our cycling holidays in the French Alps to be challenging, rewarding, spectacular and most of all fun. Our chalet provides the best base for cycling within the French Alps. Every day you will get to experience some great mountain climbs. Your week will involve roughly 600km of riding and 12,000 metres of ascent and descent. Rides will include — Alpe D’Huez, Col du Galibier, Col de la Madeleine, Cormet de Roselend, Col du Telegraphe and the Lacets de Montvernier just to name a few one our Tour de France climbs list. Whilst on the road your rides will be fully-supported. Enthusiastic guides will be there to offer you plenty of support and encouragement. A support vehicle will carry a range of spares, tools and your wet weather clothing. It will also provide the necessary food and drinks to keep your energy levels to the maximum. So, if you have a good level of fitness and want to spend a week of cycling in breathtaking scenery. We can promise you a warm, friendly service with unrivalled hospitality. Climb every mountain, or so the song goes. All it takes is the right equipment, some training and the right mental approach and you can do it. 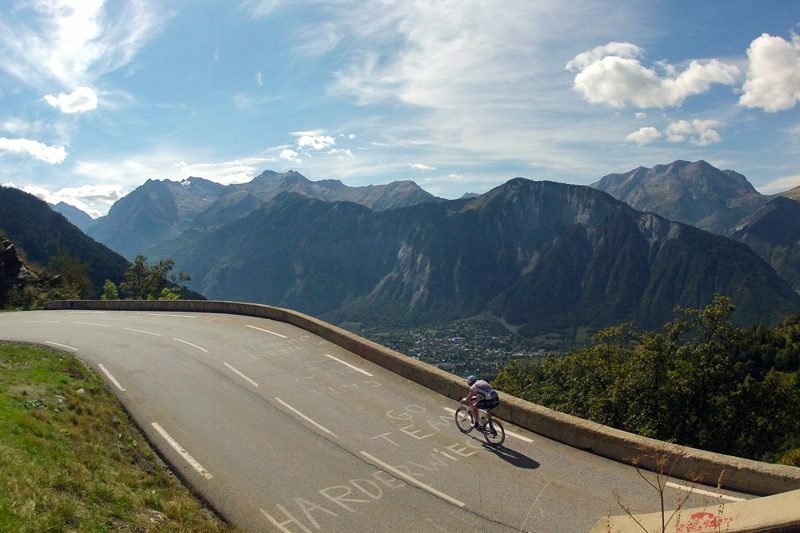 You can climb every mountain on one of our French Alps Cycling Holidays. The mountain are a challenge, they separate the champions from the very best riders in the sports, but they are also there for anyone with an average level of fitness. With a bit of training we can all get up them, slower, much slower in many cases, but that’s not the point. Cycling up a mountain climb is a personal challenge and all that matters is that you enjoy your journey to the top. 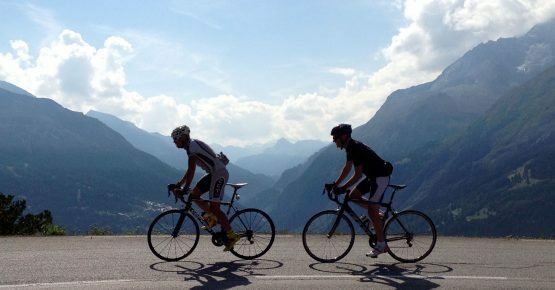 Join us on our Classic Climbs of the Alps cycling holiday and experience a week of unforgettable riding through the stunning mountains of the Northern French Alps. We are now taking reservations for the 2019 Tour de France. 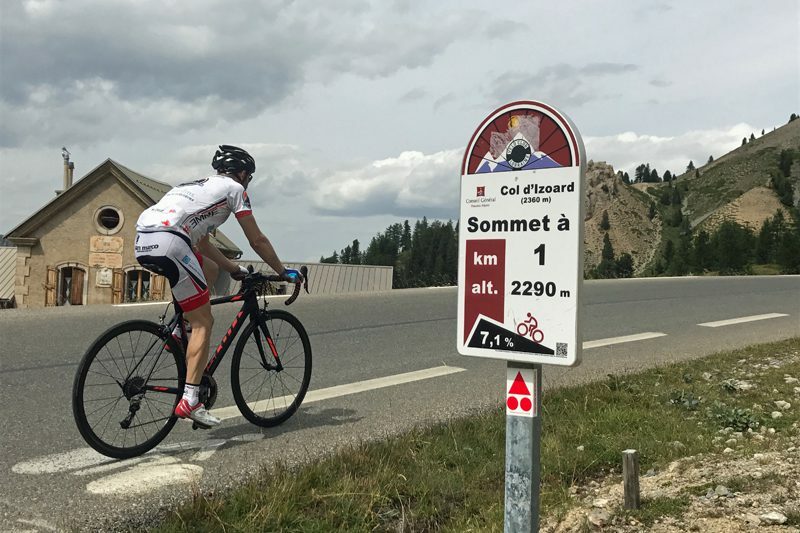 Join us for a close up view of the 2019 Tour de France as the riders prepare to fight it out in the Northern Alps. La Marmotte Gran Fondo is considered by many to be the toughest sportive in the world, its 174km route features 5,000m of height gain. The Geneva to Nice Cycling Challenge is one of the world’s greatest cycling adventures, following the famous Route des Grande Alpes.